Now that the 2014-2015 NBA pre season has officially begun, its now time for MVP Kevin Durant and the Nike Basketball family to really start banging out the colorways for KD7 silhouette. Next Saturday, we will be receiving the “Uprising” colorway which continues KD’weather-inspired theme; going with the predominately deep-upper with hints of neon and black through the model – very reminiscent to last years Bamboo rendition. 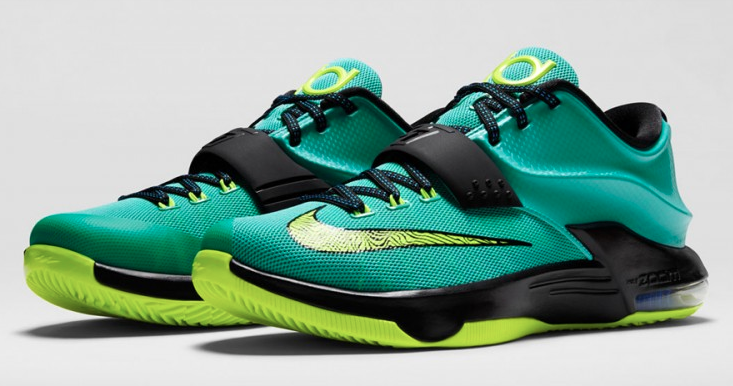 In the video above, Durant gives some insight on the sprite lighting-inspired “Uprising rendition of the The KD7’s. The “Uprising” colorway of the Nike KD7’s will be available next weekend over at all Nike basketball retailers worldwide and also over at their online shop. Check out detailed images below.